The USDA recently updated the numbers on the energy balance of corn ethanol in 2015 Energy Balance for the Corn-Ethanol Industry. Today returning guest Todd “Ike” Kiefer scrutinizes the numbers in the report and he raises some critical questions about the data and methodology. Previously Mr. Kiefer wrote an article critical of the Navy’s efforts to promote biofuels in a periodical that is sent to Congress and top military leaders. The article was entitled Energy Insecurity: The False Promise of Liquid Biofuels (discussed here). He also wrote a guest article here in the past called EPA’s Sleight of Hand on Cellulosic Fuel Rule Change. His biography can be found at the end of the article. I would remind readers that while I may agree with much, if not most of what Mr. Kiefer writes, these are his opinions. I have not taken a close look at this USDA paper myself, so it is possible that we could have a difference of opinion on some element(s) of the analysis. I don’t know that to be the case, but until I read the paper myself I offer up that caveat. This just published 2015 USDA paper on corn ethanol energy return on investment (EROI) is the latest in a string written by the same author, and in a series published under the imprimatur of the USDA Office of the Chief Economist. The author, Paul W. Gallagher, cites his own previous work 8 times, as well as referencing papers of the preceding lead author in this series, Hosein Shapouri. This paper represents a curious mixture of consistency and inconsistency. The author was kind enough to post the supporting calculation spreadsheets online. This is the most fruitful place to explore. Examination of these raises some serious considerations. The first thing of note is that the headline number — the EROI of corn ethanol — while hailed by the Secretary of Agriculture as having made great strides, is in fact little changed. Shapouri’s 2001 USDA paper found the EROI of corn ethanol to be 1.67:1. Gallagher’s 2015 paper finds the 9-state average to be 1.5:1 without credit for co-products, and 2.2:1 with credit. While this might appear mildly interesting in proportion, it is totally insignificant in context of the energy needs of a post-industrial economy, and in comparison to other energy sources. Rome achieved an EROI of 1.8:1 2000 years ago using wheat-fed slaves and oxen-fed alfalfa — right in line with corn ethanol today. This EROI, typical of agricultural age civilizations, was the best human civilization achieved for millennia. However, beginning in the 17th century with the invention of the steam engine, leading-edge civilizations quickly advanced to an energy intensity and quality of life that is sustainable only with much higher returns. The U.S. economy since the 20th century has slipped into recession whenever any significant portion of its energy supply has dipped below a 6:1 EROI, as happens with some predictability in the multi-decadal cycle of the global crude oil market. A net EROI greater than 10:1 empirically seems to be essential to economic growth in modern western nations with their extensive energy consumption overheads. Today, the U.S. economy is sustained by EROIs of approximately 15:1 (refined petroleum), 28:1 (natural gas), 30:1 coal electricity, 75:1 nuclear electricity, and > 100:1 hydro-electricity. Price is inversely correlated with EROI, and the low price for natural gas today — about $2 per million BTU — is the fruit of a wave of capital investment in technology that has not only opened up previously inaccessible shale resources, but has done so with an 85:1 EROI in the Marcellus. So, in the context of 10:1 to 100:1 EROI alternatives, and a 6:1 EROI threshold to sustain current quality of life, a 2:1 EROI is woefully inadequate. Any investor would be a fool to put his money into a 2:1 proposition when there are 85:1 returns to be had. He could certainly not afford to do so in a competitive environment and hope to survive when others are pursuing the higher returns. It would also be unconscionable to intentionally pursue a course of action that would revert his own household and his nation to the energy poverty of the agricultural age, and undermine all the benefits that accessible and affordable energy brings, such as clean indoor heating and cooking, purified water, sewerage, waste disposal, refrigeration, modern healthcare, and all the mundane miracles of transportation we enjoy today. So the question for the paper really is much more than the decimal place accuracy of the current anemic EROI of corn ethanol — it is the plausibility of its predictions for future order-of-magnitude progress. That question hinges on whether there is room for improvement in the yields of bushels of corn per acre and in the yield of ethanol per bushel of corn, without investing proportionately more energy to achieve them. The answer is no and no. It is telling to find in Gallagher’s compilation of USDA survey data that the average yield of corn continues its slow, asymptotic approach to 180 bu/acre-yr, and the yield of ethanol per bushel has been stuck at 2.7-2.8 gallons since 2001. Predictions of breaking the 500-gal/acre-yr yield wall are not happening for corn ethanol. The USDA-predicted breakthrough for cellulosic ethanol has similarly failed to materialize. Those who’ve studied and attacked the chemistry in detail, like Codexis, have had to concede that the energy penalty of hydrolyzing lignocellulose is greater than the energy benefit of its cultivation compared to starch or oil-yielding plants. Others have reconfirmed the absolute fossil-fuel dependence of modern intensive agriculture, and have realized that the charted equivalent-energy prices of biofuels and fossil fuels, while highly correlated, can never cross. Biofuels have a built-in premium to fossil fuels that is their debt to them for being the feedstock for their fertilizers and pesticides and the energy for their cultivation and processing. Unfortunately, Poet and Abengoa and DuPont did not do their thermodynamics and energy balance homework before charging ahead with quarter-billion-dollar cellulosic ethanol plants that are now years behind schedule and failing to ramp up to their promised capacities because the insiders know they will lose money on every gallon. These facilities, without some new massive subsidy regime, will soon join those of Cello, KL Energy, Range Fuels, and KiOR in conspicuous disuse. The only other facilities currently claiming cellulosic ethanol Renewable Identification Numbers (RIN) from the EPA are doing so because of EPA bad faith in administering the Renewable Fuel Standards (RFS) program. The agency unilaterally decided in 2014 to redefine “cellulosic biofuel” to include landfill methane and biogas that have nothing to do with cultivated feedstock. They also decided to redefine the world “cellulosic” to mean “75% cellulosic,” and to apply it only to the inputs, not the outputs. Thus, operations like Quad County Corn Processors can run milled corn kernels through a second cycle and count the tiny amount of ethanol produced from residual starch missed in the milling process but leached out in the secondary process as “cellulosic” because 75% of the material shoveled in was corn bran and only 25% was corn starch. It matters not to the EPA if all of that hemicellulosic material remains inert throughout the process and comes out the far end unconverted, and that the only ethanol produced is from starch; they still get cellulosic RINs from the EPA. Such deceitful and desperate measures from the EPA are still two orders of magnitude too small to inflate the current production of cellulosic ethanol to match its 2005 predictions. So, are the small EROIs in the USDA paper correct, or does corn ethanol have a chance of becoming a meaningful player in energy? When the specific numbers and calculations in the spreadsheets are examined, some things pop out to someone familiar with EROI protocols. The first thing of note is that the author favored use of lower heating values (LHV). This is contrary to standard EROI practice of using higher heating values (HHV) because of their superior utility for comparisons and conversions between energy sources. When Shapouri published in refereed journals he used HHVs exclusively (presumably based on peer review feedback), but when he published for the USDA, he used LHVs. Using HHV is particularly critical for the “embodied energy” values which are the core of EROI computations. Shapouri collected some rough LHV embodied energy estimates from a single source named Stokes in 2003 that Gallagher continues to use today. There is quite a bit of variability in the literature for the embodied energy in fertilizers and pesticides and fossil fuel inputs. For this reason it is difficult to criticize an author’s specific choice for these values. However, it was observed that the embodied energy for liquefied petroleum gas (used for drying corn) was roughly equal to its LHV. This is obviously an error, as the embodied energy of every refined fuel should be significantly higher than its HHV, let alone its LHV. In looking at the compiled USDA survey data for energy inputs, we find that natural gas use per acre for the most recent data set (2010) is mysteriously low compared to preceding years, decreasing from well over 200 cu ft per acre for every previous reporting period to only 34 cu ft per acre. The raw data inputs in the spreadsheets are all suspiciously rounded to multiples of ten, unlike other inputs, as if they are guesses or estimates. This may be a typographical error, or a survey error. Either way, the unusually low value serves to inflate the most recent EROI calculations. The most disturbing observation is that 1/3 of all the energy inputs required to grow corn were set aside right from the start. The rationale is apparently that, since only 66% of the corn plant is starch, only that amount of the input energy should be allocated to the resulting corn starch ethanol. This is an indefensible gimmick, as one is obligated to grow the entire corn plant to get the corn kernel starch. The proper way to account for the non-starch portion of the plant is to count all energy inputs at the front end of the process, and to give appropriate energy credits for any valuable co-products at the end of the process. For example, every gallon of corn ethanol produced by dry milling is accompanied by 5.3 lb of distillers dried grains and solubles (DDGS) and 2.15 lb of distillers wet grains (DWG). These co-products have HHV energies that can be counted in the EROI computations. These are obligate co-products, not optional ones, and they need to be treated holistically within the EROI calculations, not be somehow segregated out of them. In accordance with the principles of sound EROI computations, and in compliance with ISO 14044 that governs environmental lifecycle assessments, there are two ways to properly deal with co-products. The choice of method depends upon whether the co-products are economically superior or inferior to existing alternatives already in the market. If they are superior, then they get full credit for their HHV energy yield in the EROI calculation because they will naturally displace the alternatives. However, if they are inferior, then one should substitute the embodied energy of the alternative commodities already in the market, because the co-product could and would be alternatively generated in this superior way if not for forced displacement. It turns out that all the co-products of corn ethanol (DDGS, DWG, corn gluten meal, corn gluten feed, corn oil) have equivalent commodities already in the market place that are fully substitutable at lower cost in energy and money. All corn ethanol co-products can be displaced more economically by abundantly available corn meal, soy meal, soy oil, and urea. A proper EROI calculation for corn ethanol would use the energy to make these displacing commodities as the value of the energy in corn ethanol co-products. This realistic approach to EROI is part of what is called a “consequential lifecycle assessment” that more accurately portrays real world costs and benefits. When this reviewer adjusted the spreadsheet calculations to reflect HHVs instead of LHVs, and substituted some more rigorous embodied energy values, and applied proper co-product credit computations, the ultimate EROI results came out about the same for the base cases without co-product credits: 1.5:1 for dry mill and 2.2:1 for wet mill. However the values with co-product credits were only 1.8:1 for dry mill and 2.4:1 for wet mill — nothing close to the 4:1 claim for Iowa, or the 6:1 minimum to be marginally useful to an industrial-age economy. Burning stover for biorefinery process heat does not substantially improve EROI, because it is merely a substitution of one energy source for another, and its removal negatively affects the mass-balance of nutrients in the soil, and the reduction of ground cover also accelerates the loss of additional nutrients and moisture. Using stover and/or DDGS as a substitute for fossil fuels affects a calculation called the fossil fuel ratio (FFR), but there is no significant energy saving that would affect EROI. There is no free lunch. Also, anyone who has seen large-scale stover-burning ethanol plants realizes their emissions are an EPA nightmare. They operate at lower thermodynamic efficiencies and naturally belch black smoke particulates, volatile organics, sulfur, nitrogen oxides, and heavy metals like a Carnegie steel mill from the turn of the last century. They also produce fly ash and bottom ash that must be dealt with. They require essentially the same emission controls as a coal plant, and this further reduces efficiency. Clean and cheap natural gas is likely to remain the processing plant fuel of choice, and there is no evidence of the fantasy of corn farms and ethanol plants powered only by corn and ethanol becoming a reality. The low EROI of corn ethanol is the reason for this non-migration away from fossil fuel energy; the non-migration is not the reason for the low ethanol EROI. To get the highest ethanol EROI possible, one has use the highest EROI energy inputs available, and the fossil fuel alternatives are far superior to ethanol in this regard. The EROI Gallagher and Shapouri and others are really computing in these papers is not a pure corn ethanol EROI at all, but rather a hybrid fossil fuel-ethanol EROI. A true corn ethanol EROI would be for the process of making tomorrow’s batch of corn ethanol using only today’s supply of corn ethanol and nature’s inputs of sun and nutrients. Making corn ethanol this way is a non-sustainable energy death spiral. It has a huge negative energy balance without high EROI injects from fossil fuels in the form of fuels, fertilizers, pesticides, machinery, and grid electricity. Likewise, using high EROI energy sources directly as fuels is more efficient and beneficial to the economy than using them as a crutch to subsidize low-EROI alternatives. The nation’s huge ongoing “investment” in low-return corn ethanol represents a huge opportunity cost of energy and money and other resources that could be spent far more productively elsewhere. This USDA paper would have benefited from more peer review before the fact, but the author’s courage and integrity to share his data and computations online is to be applauded. We need more of this full disclosure from the USDA and EPA and DOE. Todd “Ike” Kiefer graduated from Annapolis in 1988 with an undergraduate degree in physics, and then earned master’s degrees in strategy and military history at the Army Command and General Staff College in Fort Leavenworth KS. He retired as a Captain after a 25-year military career as Naval aviator and electronic warfare expert (EA-6B Prowler pilot). He has been deployed eight times to the Middle East and Southwest Asia, and served twenty-two months on the ground in Iraq. He commanded Al Asad Air Base in Al Anbar Province Iraq, and spent three years as Pentagon strategic planner on Joint Staff. His most recent assignment was three years as CJCS Chair and faculty instructor of strategy, leadership, and warfighting at the US Air Force Air War College in Montgomery AL. Posted by Robert Rapier. You can find me on Twitter, LinkedIn, or Facebook. It is rare for an author to have the integrity to share his or her spreadsheets. Seems like it should be a requirement for publication of any kind in today’s world. The EROI of corn ethanol no matter how you calculate it is pathetic compared to cane ethanol or palm biodiesel, not to say that we should continue to allow ecosystems to be destroyed for those biofuels either. I recently heard a story on NPR about how pharmaceutical funded researchers are dominating the pharmaceutical literature because there is no money to be made doing research to refute their studies. Seems that companies should be forced to pay into a general fund to compensate independent third party researchers who want to vet the results of other researchers’ studies. That last idea about being forced to pay into a fund for third party researchers sounds great! I will be waiting for the oil companies to do that. …as well as wind, solar, nuclear, coal and on and on. No point in singling out oil. Bias is part of being human. Better to have published peer review studies as the honesty motivation. Third party supported agencies will get corrupted, such as the accounting certification of last economic disaster. Government supported agency woefully easy to corrupt per Union politics. This is probably the biggest pollutant of honest GW data. 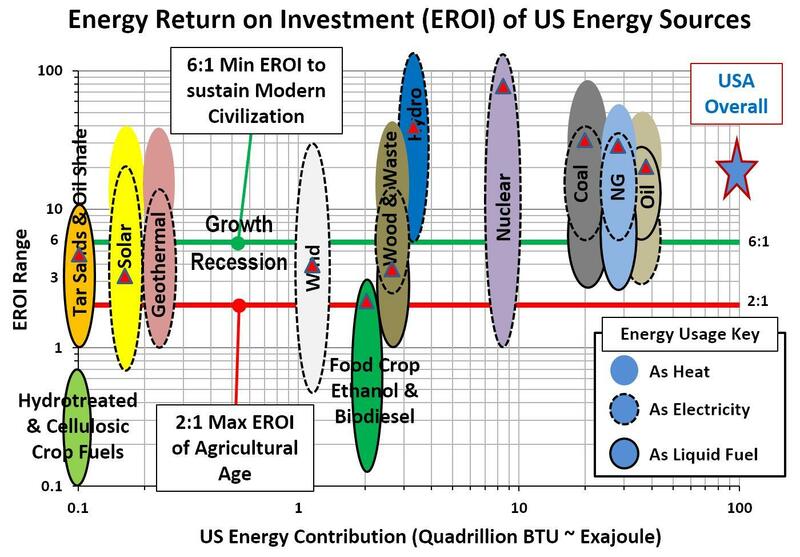 EROI is not as important as cost of energy. Useless to have expensive energy source. Land mass utilization or nature vs man. Naturalist desire man to go away. That the forces of nature will eventually reclaim the earth’s virgin beauty. A Shangri-La heaven, Utopian existence. But for whom is this existence for? Who will enjoy this? The National Geographic photographer and fat inactive kids watching the screen? My guess it would be the elitist that have earned the right to enjoy nature per Left credential of support. They want all of you to go away so they have a better experience and not smell so much of the lower class (Harry Reid). This class is upset, for example, that the beauty of Niagara Falls is commercialized and exploited to maximize popularity, convenience, profit, or access. Conversely, most think the earth and nature should be utilized and enjoyed by man. This is the Christian doctrine, that nature is provided explicitly for man’s enjoyment and care. We should utilize resources carefully and empower nature. Man can intelligently utilize nature as opposed to the constant drumbeat of environmental documentaries that claim all is doom when business of man is interjected. That’s the usual narrative and typical indoctrination of PBS. Pretty hard on the viewership’s mental health i.e. depression. We are the evil creature that inhabits the planet. I’ll read it again, but the USDA link report is an evaluation of fossil fuel in energy to ethanol energy out. In that measure fossil fuels are always below one, from the fact that it takes fossil fuel to make fossil fuel. Their is no other input other than fossil fuel. No sunshine adding to the mix. As we know fossil fuels is utilized in transportation, farming, electricity, fertilizer, heating, etc.. I searched for the EROI term within the USDA report, it doesn’t exist. Iowa ethanol achieves 4:1 ratio and the reason ethanol is call renewable fuel. The EROI measure is not without controversy as a measure. For example should tires and steel of farm tractor be evaluated? How about the steel plant and tire plant? Sunshine is energy and while extremely valuable and in mass quantities, not much efficiency in conversion to plant matter, heating, or electricity. Should one would conclude that the use of sunshine is horrible for society per low EROI? Power such as hydraulic very useful, but very low ERI. Plant matter powers much of life on earth with very low EROI. If one utilizes a waste product to make ethanol, that should be very positive. How, about a waste product that would normally emit methane and CO2 such as rotting trees and plant matter? The Quad country cellulosic calculation for ethanol, is not complicated within chemistry parlance. The EPA has strict and thorough certification, not to worry. The process must keep records. Removing a percentage of stover is not always a bad thing for field soil. To much will upset the nitrogen requirements. Agriculture colleges study soil fertility continually and publish best practices to improve fertility. Farmers work to improve the soil for future benefits. The suggestion of mischief afoot with corn ethanol co-products calculations is a stretch. That portioning energy in, between the product stream is some how inaccurate and instead the heat value of co-products the measure? This is the same author that implied accounting change of the category cellulose energy was a trick to make cellulosic ethanol production look good. The category is reported as a whole, which does include methane from sanitary landfills, but if one reads the subcategory totals all is fine. That is just patently untrue for the plants that are being discussed above. These plants do require emissions controls – like all combustion systems – and those emissions meet EPA, state, and local guidelines. The “stover-burning” plant(s) in question in this “review” do not “belch black smoke,” VOCs, etc. and have industry-leading emissions controls for all criteria pollutants. If you have evidence to the contrary, present it. The reality is that a visitor to one of the facilities mentioned in this article will see a white wisp of steam coming out of the stack. I’ll spare everyone a lecture on the rest of the by/co-products, but the ash is non-hazardous. These are important discussions and need to be fact-based, not based on emotional hyperbole. does emit everything I claimed, and does indeed belch black smoke. things and will do things as they proliferate and scale up. Biofuels displacing fossil fuels is a global proposition as envisioned by its proponents. I’ve seen that plant and toured others in Piricicaba & around Brazil. Those plants are completely different animals than the US-based plants you are speaking of in this article. Have Robert put you in touch with me if you like. I can tell you for a fact that what is going on in Brazil is not what’s happening in the United States from an air quality standpoint regarding new biomass plant construction and operation. And as far as what is happening with biomass plants in the rest of the world, in Brazil, the state of Sao Paulo is supposed to be adopting the equivalent of EU emissions regulations for those plants. Whether that actually is implemented in reality is up to debate. I have debated emissions with the Brazilians heatedly. It is difficult to change cultures, but the younger, more progressive Brazilians fully acknowledge their need to change. They are demanding advanced emissions controls for their plants. Whether those progressives will be able to change the sugarcane industry is another open question. I do know that the new sugarcane boilers being brought line there will be substantially better than the unregulated smoke belchers shown in the photo. Those old plants are so decrepit that they literally are obsoleting themselves through disintegration. One doesn’t stand too close unless one want to be clobbered by falling bricks. So, even in Brazil, there will be change for the better. Well, may they be thinking the burning of bagasse will soon be obsolete, thank you cellulosic biofuel? Lux Research has bench marked their cellulosic at a little over $2/gal selling price. The price doesn’t include the bio-mass value of lignen for powering boilers. Their should be a huge market for this biofuel that is rated ultra low carbon emissions, below that of typical power for battery car. Lignen, pound for pound has energy density of coal. Your complaint seems to be yet another reason for cellulosic biofuel production, especially within the unregulated international marketplace. We get a double whammy. Less pollution at the ethanol plant and cheap ultra low polluting fuel for transportation. They can do both locally, avoid costly imports, and increase domestic job growth/GDP. This is good stuff, not to worry. Poor countries, especially, have a opportunity to self improve. We need more cost effective solutions like this. You know, the ones that don’t need wealthy international corporations to pull the levers. Should have put this to Ike K, but didn’t want to interrupt your conversation. Another point that conflicts with the author’s position, that ethanol production is horrible for the environment. Haiti has suffered from natural and made made devastation that has crippled their economy. This has been a long suffering island state with food and energy shortages. The basics of life stuff. Per desperate need they stripped woodlands further deteriorating quality of life and asset base. Women spend and inordinate amount of time, jeopardizing their safety to harvest fallen limbs to cook with. The indoor stoves emit health harming smoke that has lowered life expectancy. A non profit is busy with the ethanol solution. Women purchase ethanol for cooking and heating needs saving a good portion of the work day to do more productive things. Indoor air quality is excellent as the fuel has no health harming impurities. Woodlands are expanding at a natural rate to improve the nation’s biodiversity. Farmers and local business are working to produce the valuable fuel upon a small footprint of land mass. This more efficient use of land, puts local people to work, and minimizes expensive petrol imports. It’s a great thing to improve their economy and quality of life this way. It a win win for environment, health, and economy. In real terms petrol was destroying the environment and their economy. This is real life experiences of value of easy to produce clean fuel. Cellulosic ethanol still has co-products, and using a boiler to extract the heating value from those co-products to generate steam for plant use is the plan for every commercial cellulosic ethanol plant I know of, save for one. The bagasse does not go away, it just is broken down to lignin plus liquids. The attached is what the GranBio cellulosic ethanol plant’s boiler in Brazil looks like. It uses lignin and other co-products as fuel. I won’t debate here if cellulosic ethanol is the future, but the below is the future of biomass power in Brazil. And that future is cleaner than in the past. Is it perfect? No. Are they doing everything I would want? No. But, better is … well … better. Damning biomass power’s future because of past mistakes and because of a controversial relation to liquid fuels production deprives us of good options in the right circumstances. This Phote of GranBio seems to be from their website. Any information whether they are producing at (or near) nameplate capacity? And, if so, what is it that they are producing? Is it ethanol? is it for fuel? I did a brief search on it and it turned up nothing. Interesting insider information. First the commercial processors are in a stage of debugging. These are the first generation of cellulosic process plants and suffer the leaning curve of removing bottle necks. They have no systemic problem or failure of basic technology. Often we outsiders have suspicions of that these businesses that can’t offer scheduled results. Opponents will claim they have no such process, they are operating a guise to harvest easy taxpayer and gullible investor money. Seems to me a nonsensical notion to offer when one steps back and evaluates the effort. In fact the ethanol industry is tight lipped per the competition proven use of such information to maximize the negative spin in effort to gut the RFS. We are experiencing the normal problems the processors knew would lay upon the path. The value of going from pilot state to commercial reliable production provides but a tenuous benefit from pilot stage. There are just so many stumbling blocks other than basic processing chemical technology. This commercial stage of development is a steep learning curve upon real life valuable experiences. We read the criticism that the process should have been better developed upon pilot stage. There is only so much benefit from pilot stage and most of the mechanics not suited to commercial stage processing. There are similar histories of processors and long timelines they suffered to achieve maximum benefit of capital investment and lowest operating cost. It’s not unusual, but non the less hard to predict. Processors are upon a development cycle of commercial ethanol production. They change hardware, processing parameters, and chemistry per release date and run production for evaluation. Each release achieves improvement. They start upon the climb at 10% and now at 80% goal levels of reliable production. A tremendous discovery after each release production run. So, the trajectory is correct. Seems all the process plants in the same boat, other than the Quad country process that instead have suffered per RIN market. Thanks Forrest. I take it that it is way below nameplate, but improving. I have seen no publicly-available production figures either. Please keep in mind that I am only taking a position regarding the plant emissions issue. Just for background, Brazilian ethanol plants (the traditional variety) produce several different products: hydrated ethanol, anhydrous ethanol, fusel oils, sugar, steam for internal use, and electric power to the grid. I don’t recall if the ash is landfilled or used as a filler in construction materials, but that’s a “co-product” as well. The ratio between hydrated, anhydrous ethanol, and sugar is constantly adjusted based upon the market rates for each, so what a plant produces literally can vary by the day or week. The cellulosic ethanol is usually a bolt-on to an existing plant to use the bagasse. This particular GranBio facility was intended to produce ethanol (I don’t recall if it was hydrated or anhydrous). There are also co-products that have ratios that are fairly fixed according to the proprietary cellulosic process chemistry, and are usually lignin and a liquid co-product. All of the streams need to be monetized for a plant to work economically, so it’s not just a matter of does the plant make ethanol or not, but, yes, ethanol was indeed the stated purpose of the GranBio facility at inception. Usually? How many such plants are there? More than two? From Forrest’s message I take it that this one (the 2nd gen bit) is producing way below full capacity. Would you know whether any working as designed? I haven’t read much of complaining of biomass energy. Everyone I know thinks it’s a good fuel. I utilize 75% efficient wood stove for supplemental heat at home. It’s a wonderful backup and emergency heat source, even for cooking. Provides much comfort upon winter cold. There is something about the activity that brings folks together to fight the chill and watch the flames. Once the stove is operating at peak temps the chimney has no smoke. The neighbor asked why I wasn’t burning wood. May Ike’s picture have been taken at startup? I read an analysis of a Vermont home putting in a wood stove vs a Colorado condo putting in solar. The taxpayer cost vs environmental improvement. The wood stove cost taxpayer nada vs the $$$ thousands for solar. The kicker was the wood stove was rated to have 2x the environmental benefit. We may be a bit foolish with taxpayer money? In Michigan we utilize chipped wood for power generation. Transportation costs are a killer, but most of it would be rated waste. The environmental benefits to utilize the wood for power vs just letting the wood rot and emit CO2 and methane are huge. We have a lot of nuclear power, too. Some excellent wind resources, but a small fraction of state. If ever someone could figure out a cost effective off shore wind power turbine, we could produce as much power as Texas. If this global warming science were truly accurate and we had to accomplish much upon the planet, we would focus like a laser on biomass. We would have to maximize utilization of mature trees, optimize forestry practices, decrease fire hazards, maximize wood products use, and maximize the intensive growth of biofuel feed stock. This would be the highest return on investment. Energizing natural forces. Past that nuclear, hydro, geothermal, and wind to displace coal. Biofuel is superior fuel as compared to fossil fuel for ICE performance and emission thereof. It even rests at good cost point. The fuel exceptional for environment per utilization of biomass, meaning the feed stock is the solution. A good thing. In looking at all of the different EROI’s for the fuels, at what point do you separate the past from the present? I find it hard to believe that deeper ocean rigs and tar sands have the same favorable EROI’s that the past oil sources do. I’ve read time and again about how the oil is there, but its harder and harder to get. Also, while we’re looking at this from an energy perspective alone, how do we put the geopolitical costs in there as well? The need to do business with hostile nations, or the fact that we’re inadvertently supporting them by continuing to use the oil from the global market, has to be assessed somewhere. Yes, in the last couple of years our production has soared and that hurts our foes as much as it helps us, but that is a blip in the historical trend. While the current EROI might not be as good as petroleum, I do think its improving, and will continue to improve as research continues. However, I do not think our production from the shale, or our access to cheap oil will be as easy in the future. EROIs are indeed constantly evolving with changes in technology and resource accessibility. 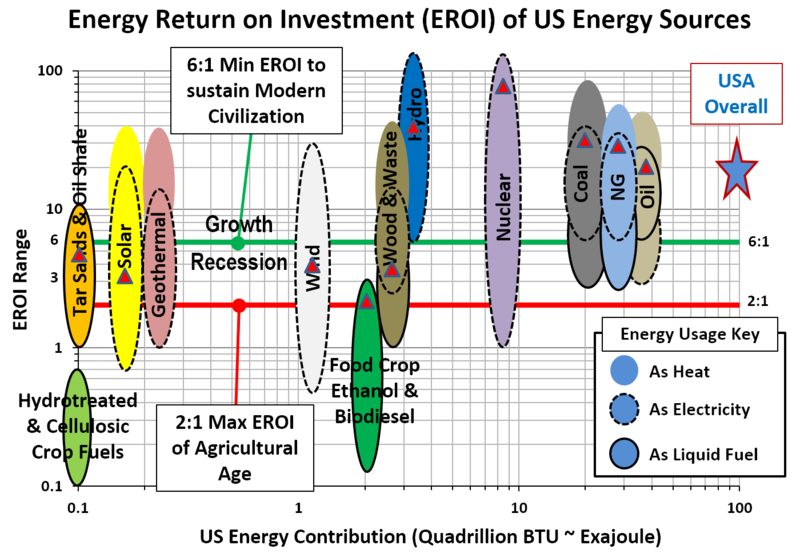 This graphic is based on my literature research and represents the estimated historical ranges, future potentials, and current EROIs of the major primary and secondary energy sources. The are lifecycle EROIs (include commissioning, lifetime O&M, decommissioning), not instantaneous ones (daily production energy balance). You can see tar sands are distinguished from oil to emphasize their lower EROI, but there is no distinction made between conventional terrestrial, tight, and deep water oil. There are many additional distinctions that could be made (associated v. disassociated gas, vertical v. horizontal drilling, etc. ), but not all the cases have been well-researched and published. I am not as confident as you seem to be that deep water oil has lower EROI. It certainly has high capital cost ($100-200 million per well), but the reservoirs tend to be huge and at high pressures that reduce lifting costs. If the lifetime productivity is proportionately higher as well, then EROI would be roughly the same. in case others haven’t seen this . from RSquared in Forbes . The critical review of energy sources should include life cycle analysis as that provides a bigger picture for evaluation. Also, the indirect costs as society will suffer or improve with choice of fuel supply. This stuff is magnitudes more important for health and well being of the countries citizens. I won’t bore you with the usual hype of GW, but if half of it is true, what is that cost? EPA has switch grass ethanol fuel carbon carbon intensity out 30 years at -124%. Meaning they expect the fuel to naturally reduce carbon. That would be a better condition than the battery car powering up on the grid could ever achieve. That could prove to be incredibly precious attribute. How, about the always present ware fare for limited resources. This cost is always present whether, water, gold, land, diamonds, or oil. Growing up in northern U.S. territory, I noticed plenty of historical markers of Indian ware fare. They were fighting for animal hunting resources. The need of conquest for better food supplies abated when society evolved to growing or razing their own. I can imagine chieftains thinking the return on energy was horrible, when they could just go out and chuck a spear into dinner. How to put a price tag on reducing incentive of war? We must acknowledge that crude oil is not universally available across the globe. There is enormous unearned wealth created by chance of geography location. This acts to concentrate incredible wealth to the few. We understand that in economic terms, having wide dispersal of wealth is most efficient for humanity to benefit the many. For example building a bigger yacht only helps a few, where as powering up an ethanol process plant helps hundreds. The few must purchase expensive fighter jets to protect their wealth. That will add to employment, but at a cost of killing and warfare. How about fuel emissions impact on human health? If one fuel supply has less impact on deteriorating human health won’t that be very valuable? I had the same issues with the new reporting. The USDA pretended that all of a sudden farmers stopped using natural gas to dry corn because they had a dry fall, and didn’t average those points with the past 5 year reality. Then they reported this as fact with no accounting for the fact that next year or this year, farmers will use natural gas to dry the corn crop. This discrepancy greatly changes the outcome of their conclusions.